How will I receive my Certificate after I pass the exam and how do I print my certificate? You will be able to view and print your certificate from the home page of your training log-in page and you can print a wallet-size certificate or a full-size certificate. How long is the online Caregiver Certification course? 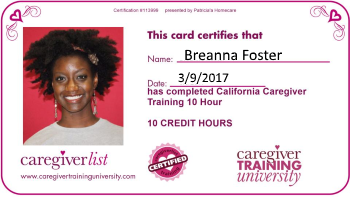 The Certified Caregiver training course format has been designed to take 10 hours of time which includes reading and learning each of the training skills. Each caregiver skill has been separated into a module for the topic, allowing you to study that skill and answer the questions. If you have some caregiving experience and are familiar with some of the skills then you may find you are able to complete the course work in less than 10 hours. Review each state's required caregiver training hours. Do you need to allow time to take the 8-hour course all at once? No. You may take the course at your own pace, logging out of the program when you are finished for the day and then returning to log-in again when you are ready to continue the training. How long from when you purchase the Certified Caregiver Training course until you receive a log-in and password? Usually you will receive your log-in and password for the training within a few minutes but are guaranteed to receive it within 24 hours of purchasing. May I allow someone else to take the course with my Certified Caregiver training course log-in and password? No. If you do allow another person to view the course and take it, they may do so but the Certificate will only be available in the name of the person it was purchased for and will match the log-in and password provided for that person only. This means that the Certification is only granted to the name that matches the log-in and password for the online caregiver training. What if I do not pass the professional caregiver certification course successfully? You may continue to repeat the course and take the test again, with the same log-in and password and once you have passed the test at a success rate of 80% or higher, your Caregiver Certification will be granted. How will an employer know I have passed the Caregiver Certification? Your name will be entered into the Certified Caregiver database and you will have a Certificate of Completion to show an employer. Employers who are enrolled in our Caregiver Training Portal will see your results in their portal because they will have enrolled you in the course. Do I need a high school diploma to take the Caregiver Certification course? No. Anyone may take the Certified Caregiver Training course. Will I be a Certified Nursing Aide once I take the 8-hour online Caregiver Certification course? No. The Certified Nursing Aide certificate is granted in each state after you attend a C.N.A. school and pass the state’s C.N.A. exam. You may find C.N.A. schools in your area and take a sample or practice C.N.A. exam online to learn more about becoming a Certified Nursing Aide. Does the online Caregiver Training meet the training requirements for caregivers in every state? Yes, the course meets the professional caregiver training requirements in the states which require licensed senior home care agencies to provide basic training skills to senior caregivers. The course was created to match the criteria for training passed by the state legislators, which would be the basic skills anyone working as a professional caregiver should be proficient in. May I review the Certified Caregiver training course information to find out what skills are taught? Yes, you may review the training modules here. How much does the 8-hour online caregiver certification training cost? You may purchase the course for $59 and receive a t-shirt and lapel pin. May I review the online caregiver training course questions prior to purchasing? Yes, you may review some of the sample caregiver certification course questions here. The course has been designed to be user-friendly and to meet testing guidelines. How many hours of training are required? It varies by state. The basic training skills are similar in each state, but some states may require more learning in certain areas as specifics change as bills become laws. California requires 10 hours of training and Illinois requires 8 hours and New Jersey requires 60 hours of classroom training. The basic training course that covers all the mandated skills will be about 8 hours, allowing for study time along with time to review and take the exam. How do I find the training required for my state? When you purchase the training, you will receive the basic caregiver training for caregiver certification and if your state has specific requirements, you will receive that training. Washington state is the only state that requires almost as many hours of training as required by a Certified Nursing Aide and as the state pays for this training for Medicaid caregivers. You may purchase the online Caregiver Certification course here. You may apply for a senior caregiving job near you to begin working as a part-time or full-time professional senior caregiver.